Buy Christmas presents and personalise yourself. Buy gingerbread cookies and decorate with icing. Wrap with cellophane and ribbon. 2. Print pillow cases: Buy pillow cases and textile paint. Make handprint or footprint pillow cases with kids or make Christmas patterns. 3. Goodies in a jar: Buy goodies and fill a jar with layers of different goodies. Attach a piece of cloth on the jar lid or paint it. Wrap ribbon around neck of the jar and tie into a bow. 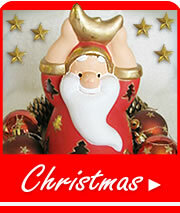 Use a Christmas picture as a label. The jar in the picture contains chocolate raisins and yoghurt raisins. 4. Cake in a jar: Fill a jar with layers of dry ingredients of a cake. Attach a recipe telling what to add and how to bake. 5. Candle with pearl decorations: Buy pearl wire and wrap it around a candle to form a decorative collar. 6. Angel candles: Cut out a strip of transparent paper or white paper and glue an angel picture in the middle of the paper strip. Wrap the strip around the candle and glue the ends together. 7. 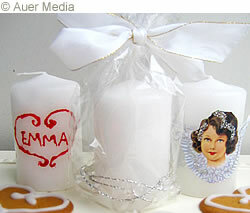 Candle with a name: Buy candles and candle decorating paint in tubes and personalise candles with names.